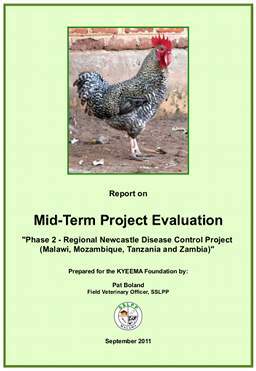 In 2011, the KYEEMA Foundation conducted a mid-term review of the Regional Newcastle Disease Control Project which it was implementing under funding from the late Australian Agency for International Development, AusAID. 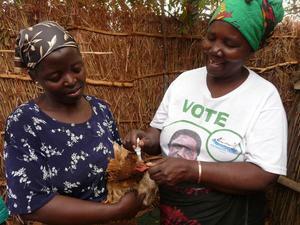 The review was conducted with expert assistance from the Small Scale Livestock and Livelihoods Program (SSLLP Malawi). The following executive summary from that report illustrates the importance placed on Newcastle disease vaccination and the potential for further development of Newcastle disease vaccination programs throughout Malawi. The project under evaluation works with the village chicken - arguably the most important livestock species for southern African smallholders. It seeks to control the most important source of loss in that species - Newcastle disease. It is thus not surprising that in the entire livestock sector, there are few opportunities for as broad-scale an improvement of smallholder livelihoods as is presented by the ability to deliver an affordable, practical preventive measure against this disease. 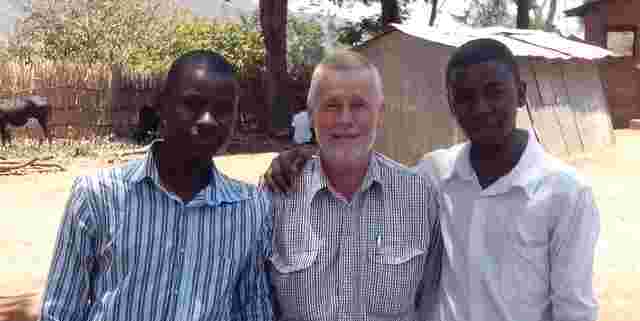 This project is one small part of a wider matrix of development work over two decades to provide smallholder farmers with the wherewithal to protect their chickens against Newcastle disease. The project is doing a remarkably good job at this phase of the journey. It is working in the right direction at the right time in a manner consistent with the context of the story. It is doing so thanks to the dedication and hard work of a myriad of individuals, both within the project and in government services and communities in the target countries. At the relevant levels, the project has benefited from the vision of its designers and from the dedication, perseverance and practicality of those responsible for its execution. The host of recommendations in this report should not divert attention from the fact that so many people have worked so hard to achieve so well. It is with a certain sense of trepidation that the writer makes so many recommendations which might give the impression that the project should be better managed. Not so. Let it be said from the outset, without ambiguity, that this project is being managed and executed very well, with a level of expertise and dedication that should be the envy of similar projects. The recommendations arising out of this evaluation focus on the importance of motivation and education of communities so that the benefits of vaccination are well understood; the need for motivation and empowerment of community vaccinators; the need for sustainable financing, smooth functioning and quality control in vaccine production units; and the need to support the emergence of a demand driven system operating on a broad country-wide basis. But to reiterate, we are talking about a journey here, a journey of which this project forms just one part. We should not lose sight of the historical context - the decades of scientific and logistical development which have gone into the isolation and reproduction of a suitable vaccine agent, the years of focussed work to test the practical and logistical implications for vaccine delivery - nor should we lose sight of the road ahead, the widespread access to vaccine and knowledge, and the translation of success from focussed target areas to whole countries.